BUJUMBURA: Burundi’s president joined long lines of voters Thursday in a referendum that could extend his rule until 2034, despite widespread opposition and fears that deadly political turmoil will continue. “I thank all Burundians who woke up early in the morning to do this noble patriotic gesture,” President Pierre Nkurunziza said after casting his ballot in his home province of Ngonzi. Nkurunziza had campaigned forcefully for the constitutional changes that include extending the length of the president’s term from five years to seven. That could give him another 14 years in power when his current term expires in 2020. Burundi’s president is the latest in a number of African leaders who are changing their countries’ constitutions or using other means to prolong their stay in power. Nkurunziza’s opponents want him to go, saying he has ruled longer than Burundi’s constitution allows. More than 1,200 people have been killed in protests since he decided in April 2015 to pursue a disputed third term. Observers have expressed alarm at reported violence and intimidation of perceived opponents of the referendum in recent days, including threats of drowning and castration. A presidential decree criminalized calls to abstain from casting a ballot Thursday. Bujumbura, the capital, had long lines of voters as security forces were deployed across the city. Five million people across the country were registered to vote. 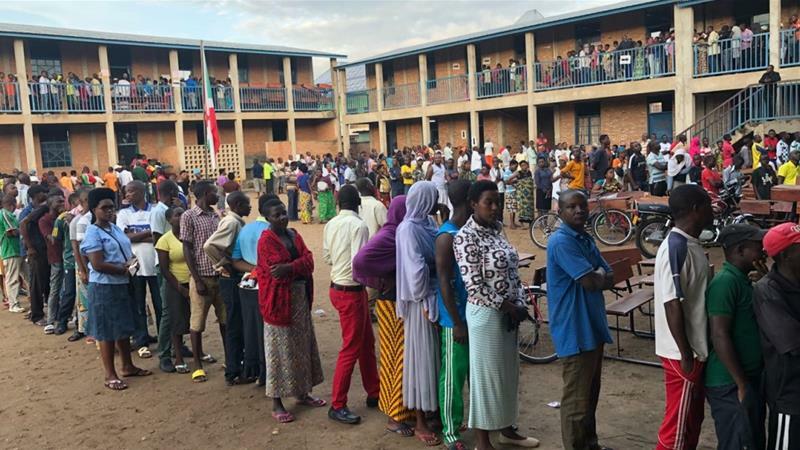 Voting appeared to be going smoothly in most areas, although activist group iBurundi, which monitors alleged abuses by authorities, reported some allegations of intimidation. In one area in the central province of Karuzi, police “arbitrarily arrested” a representative of opposition group Amizero y’Abarundi who was there to observe the voting, iBurundi told The Associated Press. Nkurunziza’s main opponent, Agathon Rwasa of up Amizero y’Abarundi, condemned what he called irregularities in the vote. “Intimidations of all sorts are happening. There are some people who are going even to the voting booth to tell people how they must vote. This is contrary to the ethics of democracy and its spirit,” Rwasa said. The government was not immediately available to respond to the allegations. Polls were closing at 6 p.m. local time. It was not clear when final results would be announced. Tensions rose last week after unidentified attackers with machetes and guns carried out a massacre Friday in the rural northwest near Congo, killing 26 people, many of them children. The government blamed a “terrorist group.” It is not clear whether the attack was related to Thursday’s vote. The 54-year-old Nkurunziza, a former rebel leader, rose to power in 2005 following a peace deal ending a civil war in which some 300,000 people died. He was re-elected unopposed in 2010 after the opposition boycotted the vote. Nkurunziza in 2015 said he was eligible for a third term because lawmakers, not the general population, had chosen him for his first term. Critics called a third term unconstitutional as the deal ending the civil war says the president can be re-elected only once. Hundreds of thousands of people fled the political violence that followed, sheltering in neighboring countries. International Criminal Court judges last year authorized an investigation into allegations of state-sponsored crimes. The run-up to Thursday’s referendum was “tainted by violence and increasing repression of dissent,” according to Amnesty International, which suggested that Burundi’s human rights situation is only getting worse. Burundi’s government strongly denies allegations it targets its own people, saying the charges are malicious propaganda spread by exiles. Authorities ahead of the referendum imposed temporary broadcasting bans on the BBC and Voice of America, citing alleged violations.